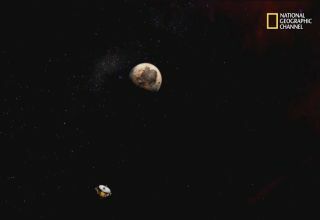 Screenshot from "Mission Pluto," a documentary about NASA's New Horizons mission that premieres on National Geographic Channel at 9/8c on July 14. Space.com has an exclusive sneak peek at the new "Mission Pluto" documentary, which will premiere next week on the same day that NASA's New Horizons probe performs the first-ever flyby of the dwarf planet. "With inside access to the New Horizons team, this is Pluto like you've never seen it before," host Jason Silva says in the documentary. "Nine and a half years in space, and it all comes down to one intense, nerve-wracking day. It's showtime." The $700 million New Horizons mission launched in January 2006, tasked with lifting the veil on a world that has remained mysterious since its 1930 discovery. It's difficult to study Pluto from Earth, since the dwarf planet is relatively small and lies so far away — 39 times farther from the sun than Earth does, on average. Indeed, the best images of Pluto by NASA's iconic Hubble Space Telescope show the object as a fuzzy, pixelated ball. New Horizons is already bringing Pluto into focus. Photos captured by the spacecraft during its approach have revealed strange dark patches along the dwarf planet's equator as well as a large, bright heart-shaped feature nearby. The flyby will bring such features into much sharper relief, of course. "To see the face of Pluto is going to be astounding," New Horizons project scientist Hal Weaver, of the Johns Hopkins University's Applied Physics Laboratory in Laurel, Maryland, says in "Mission Pluto." New Horizons has been in the works for a quarter of a century, and mission leader Alan Stern has been along for the ride the entire time. "You can feel the energy in the team," Stern, who's based at the Southwest Research Institute in Boulder, Colorado, says in "Mission Pluto." "We're almost there to get what we did all this for."